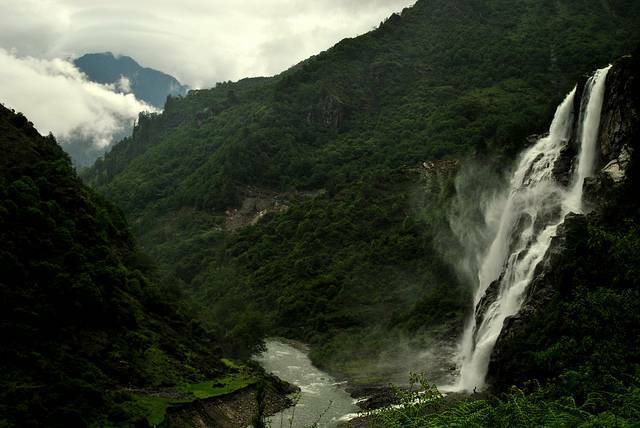 Nuranang Falls (also known as Jung/Jang Falls or Bong Bong Falls), in Tawang, Arunachal Pradesh, are located about 6000 ft above sea level and are about 40 kms from Tawang town. Relatively undiscovered by tourists, these are one of the most stunning waterfalls in India. The Nuranang river originates from the Sela pass and before meeting Tawang river it forms into this beautiful waterfall. Take a detour and stop here on your way to Tawang and visit the hydel plant near the base of the falls that generates electricity for the surrounding area. Visitors to Arunachal Pradesh need government permits.